The Hathaway Contender Outdoor Table Tennis Table was designed for outdoor use, highly durable, even against extreme temperature changes or exposure to moisture. 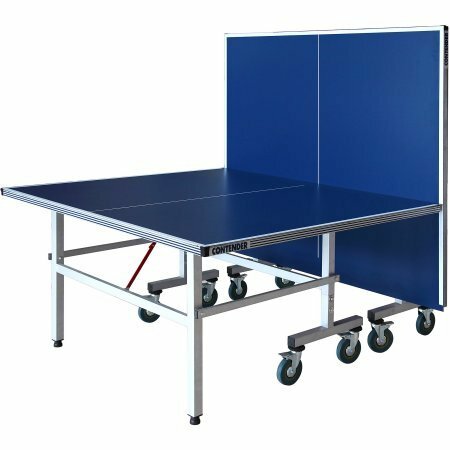 This professional grade table features an anti-glare blue 6mm aluminum composite warp-proof top with durable ABS corner protectors and silk screened lines for an even playing surface. The 1.25-inch square tube steel frame with reinforcing beams delivers rock solid table play. Perfect fit for home use, schools, recreation centers, and clubs where durability and storage are a prime concern. The built-inch safety lock mechanisms provide easy and safe folding for playback and storage. The big five-inch high quality solid rubber wheels make maneuvering this table a breeze, with wheel locks to prevent rolling during play, playback or while in storage. Adjustable levelers ensure a level playing surface even if your table is on uneven ground.